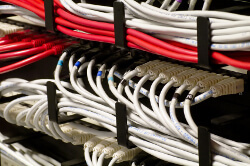 With the advent of high-speed data networks and integrated voice, video, and data, structured cabling systems provide the fundamental building blocks for the connectivity of equipment and services. If the structure cabling system is not correct in either its design or installation, it can affect the integrity of the network itself. Teletronics helps with the design, installation, project management and ongoing maintenance of the structured cabling system. Our engineers work closely with the customer to ensure the minimum of disruption to both users and the current services. We provide complete computer cabling and networking. We can help you design and execute a computer network. We install Category 5E, 6E and Fiber Optic cabling. All our installers are certified and we test and certify all cabling and equipment on completion of the job. We have a full line of VoIP Solutions that can help cut cost and make your business more efficient.